Free Tips for Protecting Your Dog Bite Recovery | Hupy and Abraham, S.C.
Do You Know These Tips and Resources for Protecting Your Dog Bite Recovery? Before you can make a fair recovery for your dog bite injuries, you need to know the rules for making such a recovery in Iowa and you need to know what you can do to protect your rights. As soon as you are physically able to take action, and to call a dog bite lawyer, it is important that you do so because your time to file a lawsuit is limited. Iowa’s dog bite laws. Iowa has a specific dog bite statute that establishes who is liable for a dog-related injury and what damages may be recovered. How insurance works. 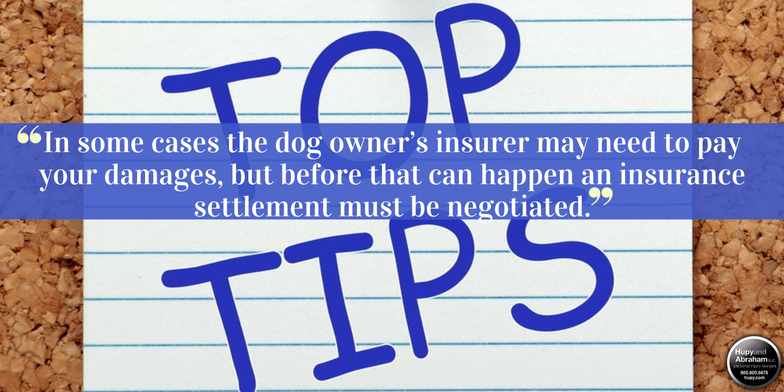 In some cases the dog owner’s insurer may need to pay your damages, but before that can happen an insurance settlement must be negotiated. How to report your dog bite injury. Your dog bite should be reported to the correct local government agency. What to do after a dog attack. Certain actions can help you protect your case. What not to do after a dog attack. Some mistakes may prevent you from making a fair recovery. The topics described above are a good place to start if you’ve been hurt by a dog anywhere in Iowa. However, you are going to have to do more than learn about your rights in order to make a recovery. You may know what to do, but now you have to do it. You will need to settle your case or get a court verdict in your favor. To recover damages, you have the right to work with an experienced dog bite lawyer who can take the stress off of you and let you focus on your physical recovery while your lawyer protects your legal and financial recoveries. For more information or to schedule a free consultation, please contact us via this website or at 1-800-800-5678 at any time. ?Who should pay for my injuries from a dog bite at a vet’s office or other Iowa business? ?What should I do if I was bitten by someone’s dog at his or her home in Iowa? ?Do I have the legal right to file a dog bite injury lawsuit in Iowa?